Saying that the public school system is “obsolete,” Bill Gates devoted billions to help bring it into the 21st century. Many others assert test-based accountability, school choice, charters, and so on are the best solutions. But each time something championed takes effect, the proponents are more often than not dismayed by the results. One tried-and-true solution appears to be as simple and inexpensive as bringing recess back to elementary school. Ninety percent of American students (some fifty million) attend public school. Federal, state, and local budgets taken together spend on public education (more than six hundred billion dollars) what we spend a year as a nation on defense. And we’re losing the battle. Some are saying that we are mistakenly imposing a free-market ethos of competition on an institution that performs much better by fostering cooperation, sharing—and play. The benefits of play for children have always been known, but testing and academic rigor somehow pushed it into afterschool hours. 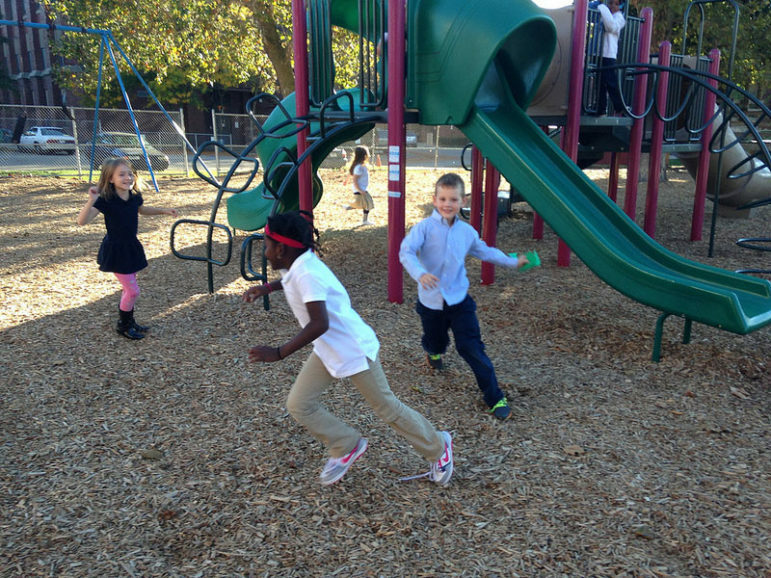 The American Academy of Pediatrics issued this policy statement on “The Crucial Role of Recess in School” in 2013. The U.S. used to know and practice this in the ’60s and ’70s. Finland apparently learned the importance of recess from the U.S., still practices it, and now outperforms us. Taking notes from Finland, the LiiNK Project (Let’s Inspire Innovation ’N Kids) is on a mission to bring play back to schools to “bridge the gap between academics and the social, emotional and healthy well-being of children. The LiiNK Project aims to develop the whole child through increased recess and character development.” They want schools to send kids outside for unstructured play four times a day, and they advocate that ethics be brought back to the school day as well. The program started in the 2015–2016 school year with four schools in Texas that used the program and four other schools that served as controls. Although it’s too early for definitive results, the short-term ones look promising. Kids in the program schools focused better than those in the control groups during the year, and reports of bullying were down. This year it is being used in 14 public schools in six school districts in Texas and Oklahoma. Play allows children to use their creativity while developing their dexterity, imagination, and cognitive, physical, and emotional strengths. Play is how children strengthen social bonds and learn they are not helpless. Montessori schools and Tools of the Mind curriculums are designed to capitalize to great effect on the benefits of self-directed free play and student-initiated activities. The LiiNK Project makes a persuasive argument for more play and character building in the school day by comparing Finland to the U.S. The LiiNK Project asserts that if U.S. schools repurposed six hours of schoolday content a week to recess and ethics, U.S. schools would still have two more hours of content per day than in Finland’s schools. Valerie Strauss covers education for the Washington Post, and it’s not the first time she’s written about the importance of play. Strauss writes that the LiiNK Project was developed and is directed at Texas Christian University by Debbie Rhea, a professor and associate dean of research in the Harris College of Nursing and Health Sciences. “I started the program because I was tired of seeing students burn out by third grade, teachers burn out in five years, and schools that focused primarily on testing from the time children entered in pre-K or K all the way through high school,” Rhea wrote in an email to Strauss. In California, Governor Gavin Newsom submits his first budget, which calls for over $1.8 billion in spending to boost early childhood education and child supports throughout the state.